Technology has constantly been evolving and so the concept of the Internet of Things (IoT). The connection between the devices and sensors to the internet has unleashed the era of progress and innovation, which was once beyond reach. This new age significantly affects the way we do business now. The ventures who have decoded the science behind the use cases and understood the potential of IoT are the ones who are expected to bring great disruptions over the next ten years. 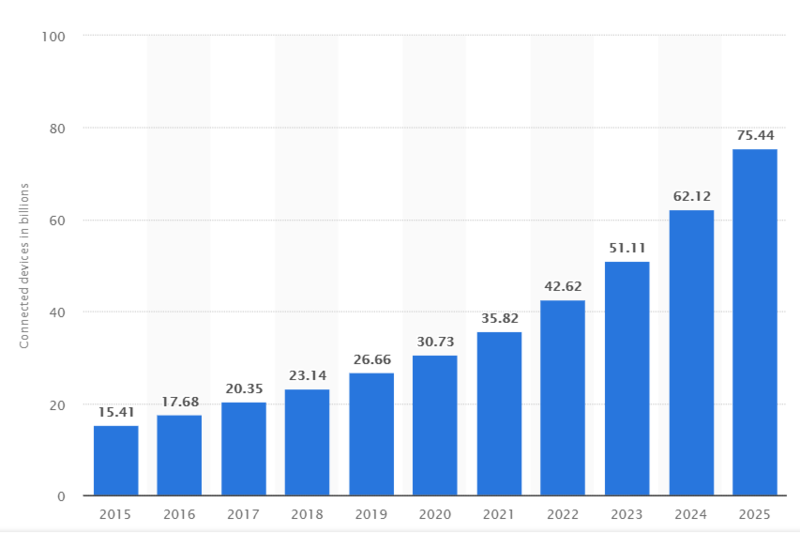 With market researches suggesting an increase in the number of connected devices up to 75.44 billion by 2025, let’s explore the aspects of industries that are witnessing this change. According to Garter, “Internet of things is a network of physical objects that uses embedded technology to communicate and sense or interact with the internal states or the external environment.” In other words, the devices around us can be connected to the internet to form a network. This network, in turn, enables automation, data capturing, and control devices and processes from a remote location. Embedded systems form an integral part of these systems and allow IoT-enables systems to carry out the designated tasks like turning on the lights on an input signal, perfectly. The utility industry is one of the earliest adopters of IoT. It gives the companies a firm grip on the operations, upgrades the power quality as well as the security. Problems related to inefficient recording and incorrect billing have ended, thanks to the smart energy meters that allow more granular energy consumption recording. They also help you keep track of the users who prefer green technologies thus enabling you to formulate your plans accordingly. In addition to this, IoT also ensures efficient functioning of the solar power panels and other environment-friendly devices paving ways for a better tomorrow. As Industry 4.0 movement continues to enable enhanced automation, data collection, and analytics, the Internet of Things had been augmenting major aspects of it. With intelligent systems that also optimize the workflow and processes, programmed devices are installed to deliver surprising outputs on the assembly line. They facilitate an easy collection of data from the external sources as well as the machinery, which ensures failure avoidance while supporting proactive maintenance or automated failure recoveries. Also, the analytics and data captured by the devices in network facilitate deeper insights to foster optimizations. This exchange of data aids the improvement of workflows and processes on the go. Combination of IoT thus fosters Smart Factory Establishment making the idea of intelligent manufacturing, a reality. The IoT addition to agriculture has bought significant transformation to this industry to bring about benefits in terms of crops productivity and yield, besides others. Precision farming is no more a dream now. Through smart internet-connected sensors and technologies, it helps the farmers to keep track of crops and livestock, measure data on-farm resources, and allow better land survey through aids like drones. IoT powered technological advancements now empower the agricultural workers to cater to ever-increasing food demand while helping them maintaining productivity and minimizing the risk factors. Healthcare industry is one of the fastest adopters of IoT. Integration of IoT features into the medical devices paves ways for improving the quality and effectiveness of services. The immense popularity of technology in the healthcare industry has helped the Giants to coin a new term known as Medical Internet of Things. Intelligent devices such as wearables and smartphones are amazingly supporting fitness, health education, symptom tracking, and collaborative diseases management on the go. Insights gained by collecting this data from various sources is driving major disruptions of the healthcare world, business processes, and real-time decision-making. 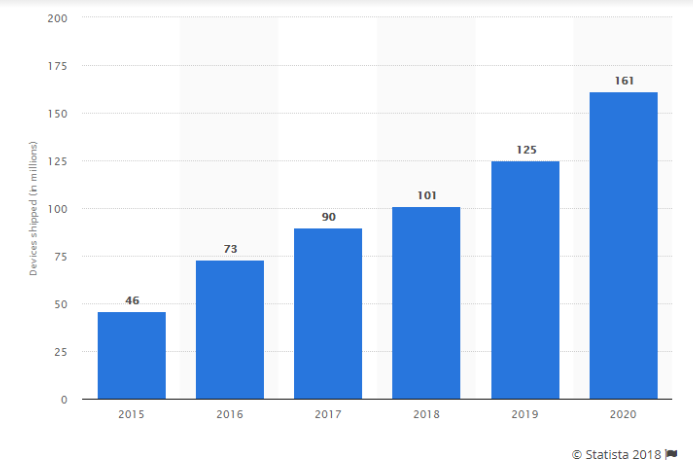 Trends suggest that the number of smart healthcare devices being shipped around the world has been on the rise since the year 2015 and is expected to grow up to 161 million by 2020. Upgrading our home automation systems into smart homes has been one of the most prevalent applications of IoT. Various intelligent devices and technologies powered by IoT like personal assistants including Amazon Echo, Apple TV, and Kikset smart locks are revolutionizing the way we love in our homes and interact with it. IoT has enabled the home automation systems that have the potential of operating by understanding the behavior of residents to operate the connected devices and appliances. Not only this, it enables high energy saving and significantly reduce the cost. This is the reason that smart home or home automation systems have been gaining worldwide popularity. The global smart home market was valued at USD 35.7 billion in 2017 and is expected to grow up to USD 150.6 billion by the end of 2023 (Source). These facilities hence provide a great boost to the supply chain management’s quality by providing transparency in business transactions, inventory control, as well as asset tracking. Probably this is why enterprises are taking a keen interest in embracing IoT with their logistics. 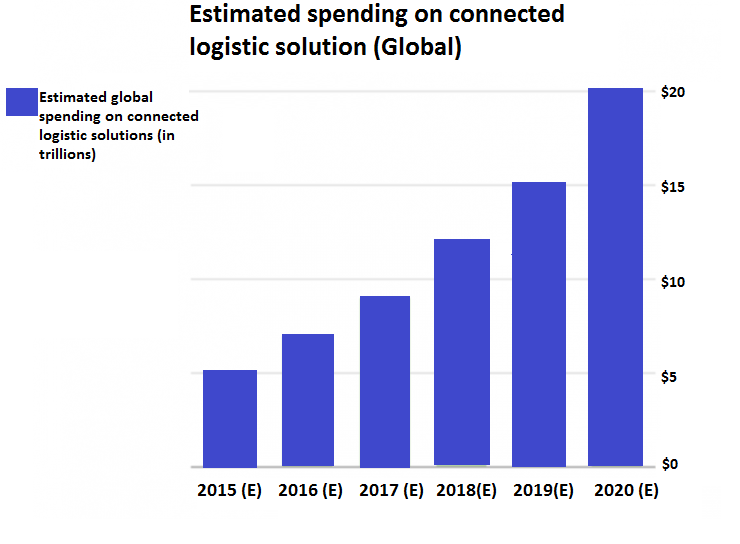 Here is the estimated global spending on the IoT- powered logistics solutions. Introduction to IoT has posed a great pressure on the traditional high street banks while also offering them a wide array of significant benefits. Internet of things connects zillions of devices that are capable of sharing data on the cloud for further analysis. This data enables the customers to have an integrated view of their financial status in real time. Financial bodies can make use of this data to formulate best policies and offer customers with tailor-made plans that increase the bank’s reputation and helps them deliver great services. The flexibility offered by IoT and embedded systems make them beneficial for numerous applications and environments. It provides the enterprises of all sizes an opportunity to explore the power of automation and improve their data processing and analytics. This is the prime reason that IoT is expected to be on the forefront of game-changing aspects for industries in future. As the technology grows further to provide refined solutions to various industries, ever more organizations will embrace it hence increasing the competition. This will also allow the businesses who are already leading the technology bandwagon to position themselves high and earn huge benefits.